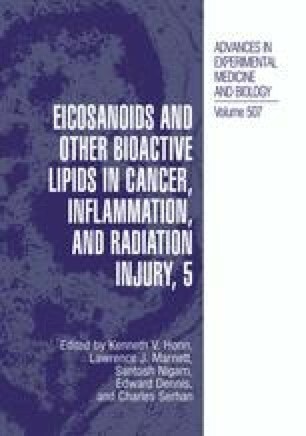 Arachidonate 15-lipoxygenase[15-LO-1]oxidizes linoleic acid, arachidonic acid, membrane lipids and low density lipoprotein, reactions of potential relevance to inflammation, membrane remodeling, atherosclerosis ’ and cancer. The oxidation products of one of its substrates, linoleic acid (LA), are involved in the regulation of both physiologic and pathologic processes2-7. The major oxidative metabolite of LA is the hydroxy fatty acid 13-hydroxyoctadecadienoic acid (13-(S)-HODE) which has been associated with proliferative processes in response to growth factor treatment3.7. Buchanan et al.3have shown that tumor cell adhesivity is dependent, in part, upon the relative amounts of intracellular 13-HODE and the arachidonic acid monohydroxide(s), 12- and/or 15-hydroxyeicosatetraenoic acids (12-, 15-HETE). Arachidonic acid (AA) metabolites are similarly important mediators of a variety of physiologic processes and inflammatory reactions, including neoplastic processes8. AA is metabolized via cyclooxygenase to prostaglandins, prostacyclin, and thromboxane9and via lipoxygenases (LO) to hydroxyeicosatetraenoic acids (HETEs), leukotrienes and lipoxins (5 and15-LOpathways) ’. Four lipoxygenases are identified in humans: a 5S-LO found in leukocytes, a 12S-LO and 12R-LO found in platelets and certain epithelia, a15-LO-1in reticulocytes, eosinophils, macrophages, prostate, liver, kidney, spleen, thymus, testis, ovary, skeletal muscle, heart, brain, or intestinal tissue (Table 1) and 15-S-lipoxygenase(15-LO-2)found predominantly in benign prostate and skin10. The15-LO-1cDNA was cloned from a human reticulocyte cDNA library “ and is found in a variety of tissues, mainly of epithelial origin (Table 1).